Not all jerseys are made equal, and official basketball jerseys appear to feature some of the most limited usage. No sleeves and thin material makes for apparel that is great for the summer heat, but not much else. Plus, not everyone is a fan of the tank top style. Fortunately, basketball is generally an inside sport, so fans and players generally don't have to worry about the outside elements when representing their teams. 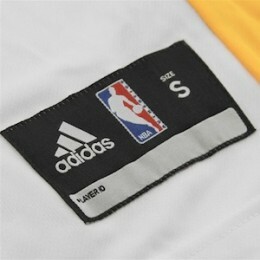 While there are plenty of brands that make basketball jerseys, Adidas is the official jersey provider for the NBA. They reached an 11-year agreement with the league in 2006 and replaced Reebok as the official supplier of uniforms and apparel. Therefore, if the NBA jersey you are interested in is not made by Adidas, and is not a throwback or vintage jersey, it is best to steer clear. While the basketball jersey has long featured the same basic design, a relatively new phenomenon is the short sleeve jersey. The Golden State Warriors were the first team to debut this new design in-game in 2013 . Despite covering more of the body, they are actually 26% lighter than the standard jerseys. Many questioned the logic behind this change, and part of the reason was related to getting more consumers to wear NBA jerseys and presenting more retail options. Although they were met with mixed reviews, Adidas plans to roll them out to as many as five teams in the upcoming season, including the Los Angeles Lakers. 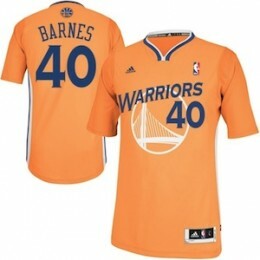 The image shown to the right is the Swingman version for Harrison Barnes. Outside of game-worn or issued jerseys, which are very expensive and less likely to be worn by the buyer, authentic jerseys are the top option for fans to showcase their allegiances. Although they're the most expensive, they're also the highest quality retail option available. 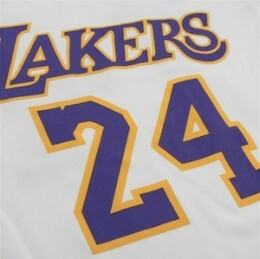 Authentic NBA jerseys are made with 190-gram polyester and include ClimaCOOL® mesh material to help with sweat. 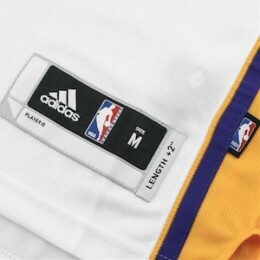 While they are manufactured by Adidas, they do not have an Adidas logo on the upper-right front of the jersey like Swingman and replica jerseys do. 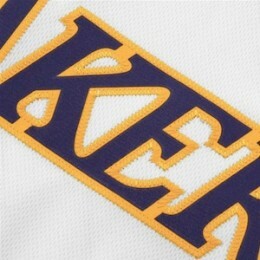 The numbers and letters included on an authentic jersey are all stitched twill. 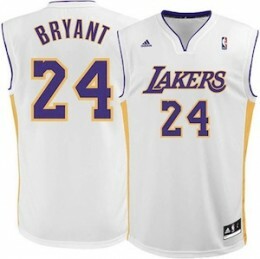 Other features of authentic NBA jerseys include an embroidered NBA logo on the upper-left front and an Adidas jock tag above the left hem. 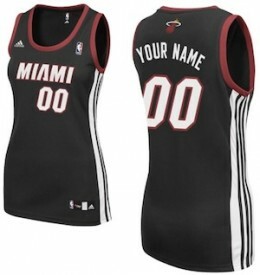 Prices of authentic NBA jerseys usually run between $200 and $300. These are normally the preferred option for framed autographed jersey, due to their premium quality and appearance. However, it has become more common to see sizes that fall between the base sizes, such as 46, 50, 54 and 58. 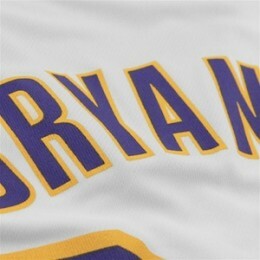 *More authentic jersey images will be added when the 2013-14 jerseys are available. Swingman jerseys are some of the most common NBA jerseys found in stores. They are a great option for fans who want a jersey that looks good but don't want to drop big dollars. Costing around $80-130, these mid-priced jerseys offer the best overall value for fans to obtain realistic-looking jerseys for casual use. Swingman jerseys are made of 100% polyester fabric and come in standard sizes, such as small, medium, large and several extra-large tiers. The team name, player name and numbers all feature sewn-on tackle twill. There are also Performance editions which are made of mesh and designed for more breathability, so the wearer stays cool. It is important to note that replica does not mean fake in the sense that most consumers would view it. Replica NBA jerseys from Adidas are still official jerseys, but they do not include the same quality as authentic or Swingman versions. While they feature good materials and construction, replica jerseys likely won't last as long as authentic or Swingman jerseys. Like most things, you get what you pay for, and the price for replica jerseys generally falls between $45 and $85. This presents a great budget option for fans. Made of 100% polyester fabric, the letters, logos, and numbers are screen printed, which is the main difference when compared to Swingman jerseys. The length of the jersey is more cut like a t-shirt as well. 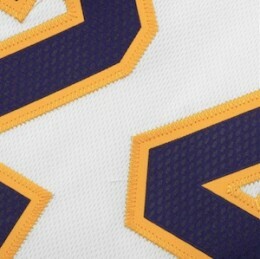 Just like the Swingman, replica jerseys showcase an embroidered Adidas logo on the upper-right front of the jersey, and have an embroidered NBA logo on the upper-left side. They also feature standard sizing. Commonly referred to as throwbacks, vintage, retro or old school, Hardwood Classics jerseys offer consumers a trip down memory lane. These popular jerseys are designed to look like the jerseys worn by top players in specific previous seasons. 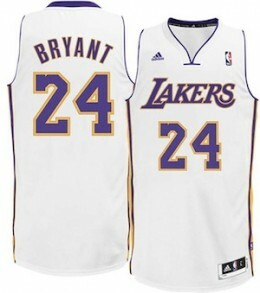 Coming in authentic, Swingman and replica versions, various jerseys are made by Adidas, Reebox or Mitchell & Ness. Understandably, the biggest sellers are the biggest basketball stars. Michael Jordan, Larry Bird and Magic Johnson are among the most popular jerseys. While the vintage term is regularly used in regards to jerseys from Hardwood Classics, be aware that they are still re-makes. 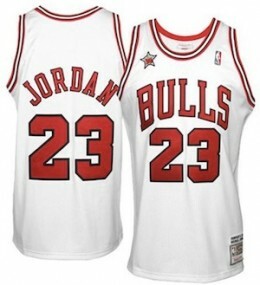 True vintage jerseys come from the actual years the jersey was featured and prices and supply can vary greatly. As many have realized, the standard men's sizes do not work for everyone. Although youth sizes have been around for some time, a rapidly emerging market for sports apparel includes female fans. The result is official jerseys with a more flattering cut, designed specifically for women. At this point, the women's jerseys fall in the replica price range and quality. The main difference from the men's version is a larger and more rounded neck, stretch side panels for a better fit and a more tapered cut. An unfortunate part of making almost any online purchase is the possibility for counterfeits. One easy way to combat this is to be knowledgeable about the product you are interested in purchasing. 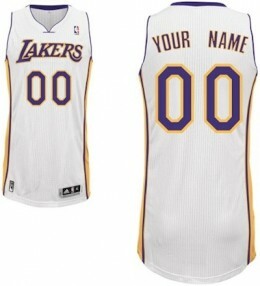 When talking about NBA jerseys, a few key areas can help you decide if the jersey you are looking at is real or fake. The first thing to note is the price. No one is selling online to lose money. If it is too good to be true, then your expectations should be realistic. Prices should generally fall in line with the ranges listed above. The exceptions would be for players viewed as busts, traded players or when teams completely change their color scheme or team name. The next thing to look at is the overall quality. The stitching should be tight and not frayed or feature poor craftsmanship. Also, the mesh should not have huge holes. One easy way to distinguish fakes is based on the logos, numbers and letters. When comparing official jerseys to fakes, the fonts are noticeably different. A good practice is to compare the jersey to images where you know the jersey is real. Lastly, don't buy something where there is no guarantee. Good sellers stand behind their products and will make things right if you are not satisfied. A lot of confusion arises due to the differences between authentic, Swingman and replica. Much of the time, knockoffs will be listed as authentic or Swingman versions. While it is usually very easy to identify a fake in-person, it can be tough to tell online. Don't be afraid to ask for additional images if the listed images are not detailed enough or appear to be stock images. A good seller will have no issue sending those. It is also good to check their feedback for instances where they have been accused of selling fakes. Just because they have a few negative comments does not mean they are actively selling fakes. However, if their feedback is littered with negative comments questioning the legitimacy of the jerseys they sell, it might be good to look elsewhere. Unfortunately, many casual buyers do not realize they have purchased fakes so they would be unlikely to leave a negative response. 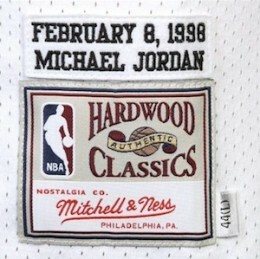 I have the red on black hardwood classic mitchell & ness jordan #23 jersey with the years 1983-84 stitched beside the logo. I can not find this jersey anywhere. I have found the same jersey with 1984-85 stitched but not 1983-84? I have found he exact sam jerseys in red and white but not black. I was told this is a very rare jersey. Could you possibly tell me what its worth or how to find out? Any help would be appreciated! I have an authentic game worn jersey that LaMarcus Aldridge gave me, and he told me to look up the code on the tag to see when it was made/worn. I can’t seem to figure out where to do that. Any insight? I can’t find where it says what country they are made in. Thank you, Trey, for a very informative and well-written review of NBA jerseys: I learned more from your review than from hours looking at the several online sites that sell authentic NBA jerseys. I appreciate your taking the time to write the review. This is some really good information about buying basketball jerseys. My brother in law loves playing basketball and I want to get him one for Christmas. It is good to know that it would be smart for me to do some research on what type of jersey he wants should look like.